If you are looking for Intermediate Weightlifting Programs that are professionally written and immediately downloadable, you have come to the right place. There are currently 12 Intermediate Weightlifting Programs immediately available for download and more are in the development pipeline. An intermediate athlete is one who engages in regular consistent training 3-4 days per week, has moved beyond the beginner stage of technique development and has developed an early understanding of the weightlifting training process. Probable key objectives of the intermediate athlete will be to improve their technical skill level, develop mental skills for better platform competitiveness, and acquire the appropriate level of strength commensurate with the performance level needed to participate in regional and national competitions. The Intermediate Weightlifting Training Programs available on this site balance the needs of the athlete for technique and strength development. Technique development is achieved through work on a variety of exercises that develop stable and strong receiving positions, and speed and confidence in movement under the bar. The range of exercises allow the athlete to focus on all aspects of the lifts by breaking full movements into components parts. The intermediate program also focuses on the development of strength by working within safe and effective ranges of intensity in various forms of pulls, squats and exercises that develop overhead strength and stability. A recommended intensity (heaviness of the bar) for each exercise of each session is provided by the program. Workouts follow a cyclical pattern of intensity allowing the athlete to recover between the highest intensity sessions. A guide to volume (number of sets and reps) which prescribes 8 levels of volume. There are 3 volume levels that allow the athlete to go beyond the stated workout parameters if the athlete is feeling good and 5 volume levels which restrict the athlete only to stated intensity and number of sets. 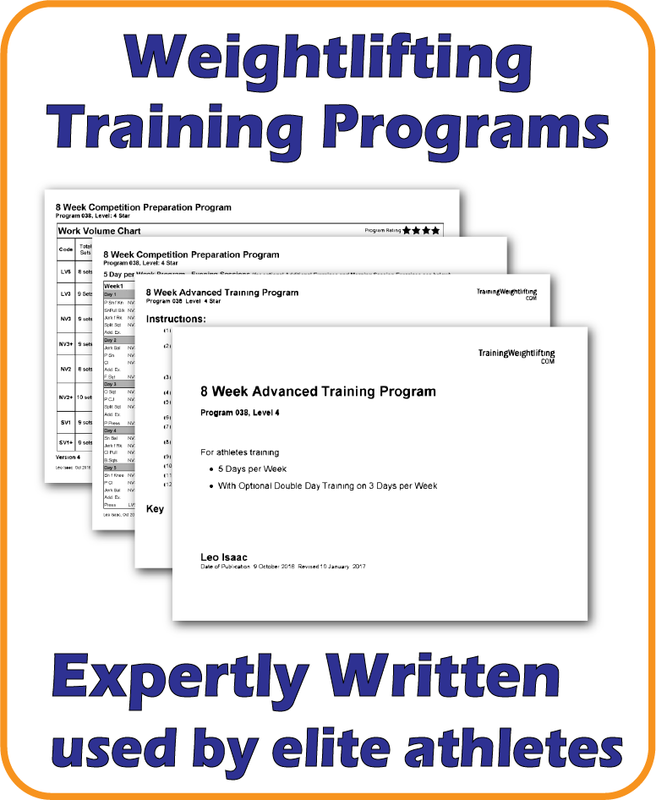 There are currently 12 intermediate Weightlifting Training Programs included in the Intermediate Training Program Bundle. These programs will suit athletes training 3 or 4 sessions per week and have training experience of more than 1 year. The programs range from 5 weeks to 12 weeks in duration and include detailed instructions and a guide to the volume of work to be undertaken. You can purchase the Intermediate Training Program Bundle by clicking the blue link below. After purchase, you will see a link titled “Intermediate Program Bundle” in the Members Area on the right side of the screen. Experienced Weightlifting coaches know the value of writing training programs for athletes. Yes, there are many limitations with a written program but if you want success as a coach, it is inevitable that you will spend many hours writing weightlifting programs. The task becomes particularly important when you have multiple athletes to look after, otherwise you will be faced with a constant stream of questions and you will find yourself making decisions on the spot that sometimes may be unwise. Therefore coaches need to demonstrate to their athletes that they have capability in the task of writing weightlifting programs. For these reasons the use of generic programs can lead to unsatisfying and possibly damaging results. Nevertheless, coaches will frequently make use of generic programs that are either developed by themselves, downloaded from the Internet or borrowed from other coaches. This is because it is far less time expensive to develop one generic program for use by several individuals than it is to develop a program specially tailored for each individual. Athletes tend not to understand or appreciate the amount of time involved in writing programs which, for some coaches, may amount to many hours per week. Even well-documented training program will have gaps in the information it presents. For this reason, athletes need to be educated in how to interpret and use a program that has been developed for them. This athlete education makes all the difference. It is quite possible to give exactly the same program to two individuals who have very similar attributes and see complete different results. One athlete may thrive on a particular program while another will think it highly ineffective. Therefore an important skill for coaches to acquire is to be able to constantly adapt training programs to the ever-changing situation of the athlete.